I can’t remember the last time the kids’ school day was canceled, but the sudden cold front and icy conditions have caused the local school districts to tell the kids to stay home. Bay is disappointed because that means that they won’t have the make-up day off later in the year. Anyways, my office building is closed but most of us are set up to work from home, so that’s what we’re doing. Here’s a photo from the deck. You can see Lani scooting out to do her business. She came right back into the house after she was done! Here in Austin, we are not used to the cold/icy conditions so even a light amount of snow or ice will cause the schools to be delayed. I guess it just doesn’t happen enough for there to be resources in place to clear the roads of the ice. Oh, and in a couple of days, the temperature will be back in the 70s, but then another cold front is expected. 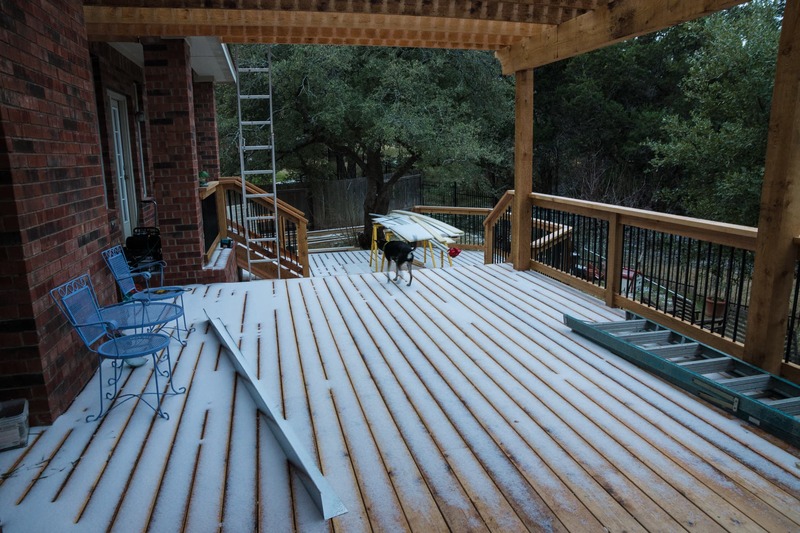 Oh, Texas winter!